Help our kids stay happy and healthy! Drop in to Kids’ Yoga on select Thursdays to enjoy a free fun, upbeat, kids yoga session. Grades K-2 sessions will be on April 4, May 2 and June 6 from 3:00 – 3:45 pm at the Clayton Huey Elementary School All Purpose Gym. Please see your grade teacher for a permission slip to pre-register. Grades 3-5 sessions will be on April 18, May 16 and June 20 from 3:00 – 3:45 pm at the Clayton Huey Elementary School All Purpose Gym. Please see your grade teacher for a permission slip to pre-register. 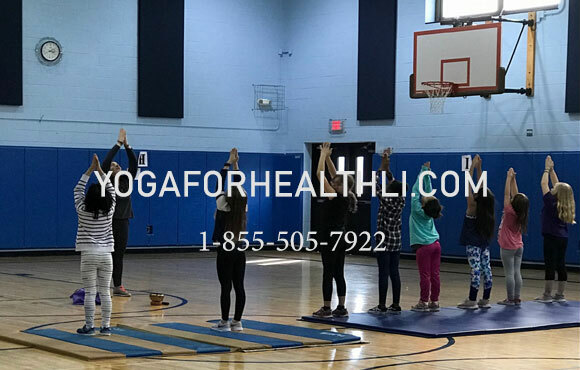 Grades 6-12 can drop into the Chill Zone After School Drop In at Moriches Community Center’s 313 Frowein Road location for Kids’ Yoga sessions from 3:30-4:15pm on April 11 & 25, May 9 & 23, and June 13 & 27. No pre-registration is necessary. Class is available to boys and girls, and will focus on balance, strengthening, stretching and having fun through yoga poses and games! Come hear your favorite songs & learn how being in-tune with your body can enhance your day! Mats will be provided and all levels are welcome to join. Kids’ Yoga sessions are FREE thanks to a generous grant from the Just Human Fund! Yoga For Kids, Gain Balance, Strength, and Awareness.